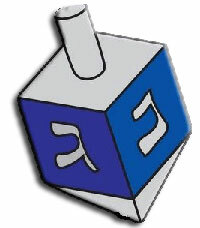 Since the 1700s AD, people have often celebrated Hanukkah by playing the dreidel game. The first thing you need to play the dreidel game is a dreidel. It’s better to buy a dreidel (DRAY-dell) because if you make your own it’s very difficult to get it to play fair: it’s always going to land on one side more than the others, and your game won’t be any fun. So just go to any toy store or department store and buy a dreidel (or buy a dreidel from Amazon). You’ll also need something to bet – often people use nuts or chocolate coins (Hanukkah gelt). Other traditional choices are pennies, or raisins. Sit on the floor in a circle, and if you’re on a rug get something hard to spin the dreidel on, like a book or a chessboard. Divide up the nuts so everyone has the same number. Everyone puts one nut in the middle to start the game. The first player (at our house, the youngest child goes first) spins the dreidel like a top. If it lands on Nun (N for nisht, or nothing), you do nothing. If it lands on Gimmel (G for gantz, or everything), you take all the coins in the middle, and everyone puts in one new one to start things off again. If the dreidel lands on the Hebrew letter Hey (H for the Yiddish word halb, or half), you take half the coins in the middle (if there’s an odd number, take the extra one too). If the dreidel lands on Shin (S for Shtel, or put in), then you put two of your own pieces into the pot. Keep going around. If you run out of nuts, you stop playing (but if you are little and might cry, maybe someone will share some nuts with you). You play until one person has all the nuts, or until you decide to stop. Cite this page: Carr, K.E. Dreidel project – Hanukkah games. Quatr.us Study Guides, August 23, 2017. Web. April 20, 2019.